Karin is ERYT-200, a native Floridian, and lifelong athlete, first discovered yoga while living in NYC. It was a natural progression as she holds a BFA in Dance from the University of Florida. Karin has experience in competitive gymnastics, swimming, running, and more recently triathlons. She found her yoga practice continued to challenge her physically, but it was the spiritual aspect of the practice that really hooked her. 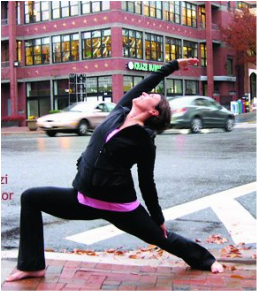 Her yoga training is Hatha-based but she loves to mix it up to include both powerful and restorative elements. Karin loves to bring yoga to people who never thought they would enjoy it – top athletes, older folks, children and even moms (like Karin) who never thought they could find balance in their lives again. Karin hopes to inspire people to keep moving – especially with intention.